Thanksgiving is coming soon, you guys. Like in a month and a week. Are you ready? Because it's fall and I'm fattening up for winter like a bear, I wanted to make a pie yesterday. But, because I'm lazy, I didn't want to go buy anything. We don't have any fruit or any nuts for any regular pies, or any cream for a cream pie, so I found this recipe for sugar pie. 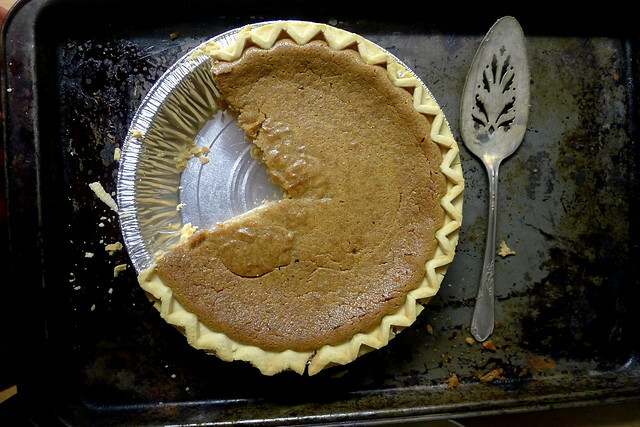 I didn't make the crust, there's no way I can flute a pie crust like that. I use the Whole Foods gluten free frozen crusts- they're something like $5.99 for two, and they come frozen so you don't have to use them both at once. So I whipped this up real quick, and oh wow. I'm making this for Thanksgiving (spoiler alert, family). 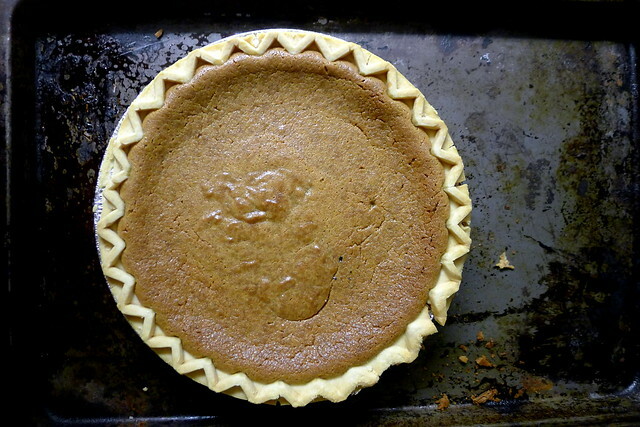 With the nutmeg and cinnamon it tastes similar to a pumpkin pie, and is similar in texture too. It's sweet, so I'd whip up a plain whipped cream (no sugar, maybe some cinnamon) to top it. I didn't because I am lazy and didn't feel like going to buy any. This is good cold, room temp, or hot. Eat this pie! Thaw out your pie crust and preheat your oven to 350. Combine the sugars, cornstarch, salt, cinnamon and nutmeg in a saucepan. Beat in the eggs, then stir in the milk until well combined. Turn on the heat to medium and cook, stirring constantly, until bubbles and thickening. Stir in the butter and the vanilla until fully mixed, then pour into the pie crust. Bake 45 minutes to an hour, mine took closer to an hour. It's done when it looks a little set when you jiggle it. Cool most of the way and then EAT! This is similar to a pie that my mom made for me (because her mom made it for her) when I was growing up. We called it "flatchy" pie. I haven't ever been able to find a recipe for it online -- and my mom never measured the ingredients anyway -- but she said it was something that they made when they couldn't afford fruit. My great grandmother sold pies at a gas station. As the wonderful and endearing name suggests, this pie, is sweet and delicious. I was passed on the recipe from a pastry chef I worked with in Montreal, nearly 20 years ago. I have been looking for it for ages and only stumbled on it recently in an old journal. Its just how I remembered, seductive, silky and sweet.